The Monster Energy All-Star Race kicked off just as night descended on Charlotte Motor Speedway, but things would only heat up as the race got underway. While the race may pay a million dollars, the million-dollar question was whether a brand-new aerodynamic package that featured restrictor plates coupled with a high-downforce spoiler and splitter combination would produce the kind of wild night the All-Star event was once known for. Matt Kenseth started on pole but quickly gave way to teammate Ricky Stenhouse Jr. 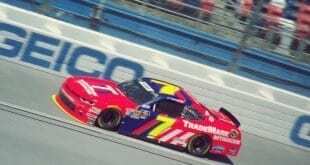 The lead didn’t last long for Stenhouse as Kevin Harvick powered by just before Kurt Busch spun on his own in traffic to bring out the first caution of the night. Busch suffered little damage and was able to continue, eventually returning to the lead lap. 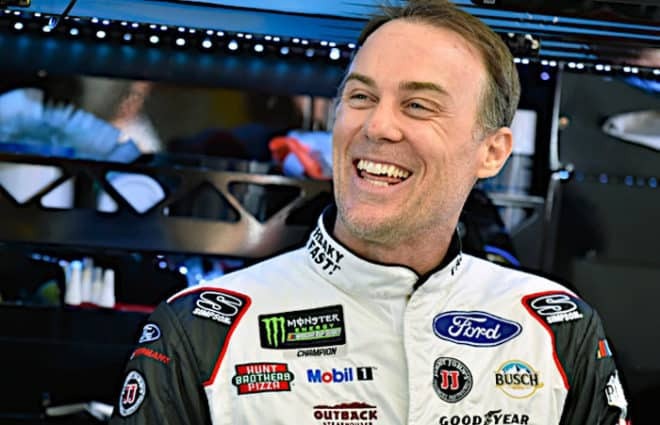 After the Open race, where nobody could drive away, Harvick proved that being out front was still an advantage, leading the rest of the 30-lap stage, but the action behind him was fierce. An ultra-aggressive AJ Allmendinger charged from the back to challenge the top 5 by the end of the stage, mixing it up with more usual suspects and making a spectacular pass in the high line. It was obvious from the start that both the top and bottom grooves would be in play, though the top had a slight advantage in the momentum cars could carry off the corners. The second stage was all Kyle Busch, all the time, as Busch took the lead on pit road between stages and never relinquished it. The challengers early in that run were Kyle Larson, Jimmie Johnson, and Allmendinger, whose car was clearly handling better than most of the field. Unfortunately for Allmendinger, he was just a bit too aggressive and brushed the wall and that forced him to pit road. His car wasn’t the same afterward. Suarez, Larson, Truex and Elliott were in the top 5 when the stage ended. Business picked up in the third stage. Harvick and Martin Truex Jr. battled fiercely for the lead. Truex had a push from Larson, while Kyle Busch wasn’t close enough to help Harvick, but just as Truex powered by, the caution flew for Kasey Kahne, who scraped the wall and shed some debris in the high groove. 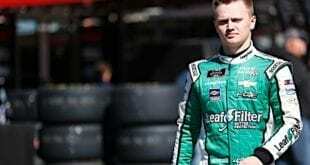 The restart featured a four-way battle for the top spot among Truex, Larson, Suarez and Joey Logano, but again the caution flew before it could get settled, with Alex Bowman hitting the wall and setting up an overtime finish. The field wouldn’t make it to the overtime line to make the stage official, as a multi-car crash collected Kurt and Kyle Busch, Brad Keselowski, Truex and Clint Bowyer. All were ok but only Kyle Busch was able to continue. A second overtime produced three different leaders—Larson, Suarez and Harvick all took a turn on point before Harvick took the stage win over Suarez, Larson, Ryan Blaney and Logano. The final stage featured some fireworks amid Harvick’s dominance. While the No. 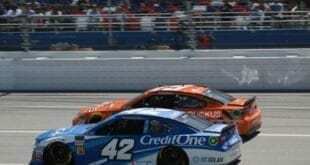 4 was in front for all 10 laps, Larson slipped up the track while racing underneath Logano, who bounced off the wall and came back with a vengeance, sending Larson sliding through the infield grass. A sneaky Jimmie Johnson drove through to make himself part of the equation, and Denny Hamlin held court behind Suarez. Coming to the checkers, Chase Elliott got by Johnson to round out the top 5 behind Harvick, Suarez, Hamlin, and Logano. On what would be the final restart of the night, Suarez looked to get the jump on Harvick with help from Hamlin, but Hamlin slipped up the track and lost the push before Suarez could clear the No. 4. Harvick, with the advantageous top groove, held on. Suarez mounted a charge with Hamlin, Logano, Chase Elliott and Johnson in tow, but couldn’t master Harvick, whose team has been the best in the Cup Series all year long—if the All-Star Race is meant to showcase the very best, then Harvick’s win put an exclamation point on what’s been a monster year. The race itself played out in the shadow of the rules package. While many praised it, others shrugged it off as a mere gimmick. Some cited Harvick’s dominance (he led 39 of 80 laps) as proof that it didn’t help the racing. It was true that leading was still a major advantage, but to some extent, the laws of physics dictate that. The top 10 cars were within 1.5 seconds of the winner…the same space between first and second a year ago. NASCAR’s Steve O’Donnell addressed the media after the race. “(There are) a lot of things still to work on. We didn’t want to push too much…you do like some things you see…so, how do we continue to look at this?” O’Donnell said that NASCAR will create a timeline for 2019 and make decisions on racing going forward. The All-star package could be a part of it at some tracks next year, but O’Donnell stressed that the sanctioning body will look at feedback from teams and fans before making any decisions. Harvick said afterward that five years from now, NASCAR will look back on this race as the one that started it all. Time will tell, but the action was furious Saturday night. Typical plate racing BS. Typical aero-push to prevent passing. Yet Amy found it a “wild night.” I guess it might beat her Red Hat Senior Ladies group, but it was certainly not exciting in the sense of beating Bridezilla’s reruns on WE TV. But I know Amy’s standards for excitement are different from mine. I think auto racing should include actual passing, even, (GASP!) passing for the lead. Maybe some of that happened when I dozed off. Hard to be sure, because I sure as hell will not watch it again to see what I missed. And I do hope Kevin is right. Five years from now NASCAR will look back on this night as the beginning of the end of the “sport.” Only I don’t really think it’s going to take 5 years. I give NASCAR 2 or 3 more years tops until it slides into complete obscurity. By then, we will be selecting a champion by fan vote. Maybe Amy and her cohorts would have liked it even better if Stenhouse had actually killed somebody out there. But alas, everyone walked away, depriving NASCAR of those beloved shots of cars covered in tarps and bodies being airlifted that we so strongly associate with restrictor plate racing. BTW, the horse race was again much better, even with the fog effects. I do suspect Justify is getting a wee bit weary however. Perhaps it’s time to put plates on his competition so horse racing can proclaim him a Triple Crown champion. But naw, they wouldn’t stoop to anything that phony. NASCAR has cornered the market on stupid gimmicks. I do think that the writers, not just Amy, are quick to use the term “wild” to describe races which are far short of that. My all-star experience. Tuned in late and was actually liking what was going on! Then DW said something about “the 10 car and the 20 car coming together, and almost making a 30 car”(tee-hee, chortle, chortle). Turned the channel and read Kevin won it the next morning. Fox, I’m imploring you! DW and Mikey need to get out of the booth and drown worms at the local lake.for the rest of their days. Next year, lets reverse it. Give them the horsepower and take away the aero. So will Harvick hold off everyone next weekend? I’m still sorting out how I feel about that racing package. To be honest it did make the race more interesting to watch because the cars were closer and therefore more side by side racing. However I can’t shake this nagging feeling that it was artificially created with the restrictor plates and therefore bogus. I understand where you are coming from. But, all of the racing in the last 10 years has been artificially created with a mixture of spoilers, wings, splitters, side skirts, roof fins, dog-tracking chass-s set-ups, bump stops, spring-rubbers, etc. This was the best competition on the track since the corner speeds (160 mph pole speeds) gave way to flat out all around the track. There were lead changes, passes in the field, and the fastest car won the race. That’s a great recipe in my book. Since there is not a perfect world, I’ll take this package. Although, I’m not sure they could make it through 600 miles without 20 cautions. Until the car in front opens a big enough hole to allow the trailing car a chance to clear it without help the “events” won’t be any different. Absolutely right. Plate racing is fundamentally flawed. And until we see fast cars pass slow cars without drafting help, NASCAR will continue to be a gimmicky farce. There seemed to be a lot of side by side racing without the cars getting aero-loose, which promoted more side by side racing. Also side drafting didn’t seem too important for once. On the other hand, even when front runners like Truex, Hamlin & Suarez got in decent runs, they obviously were frustrated that they could catch, but not necessarily pass, due to horsepower limitations. All in all, one of the better recent mile and a half races due to higher spoilers, plates and other technical considerations. A move in the right direction, maybe? I hope so!